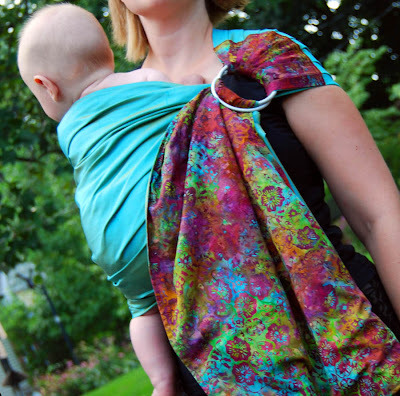 A recent order: reversible ring sling in pomegranate cotton batik and peacock silk dupioni. 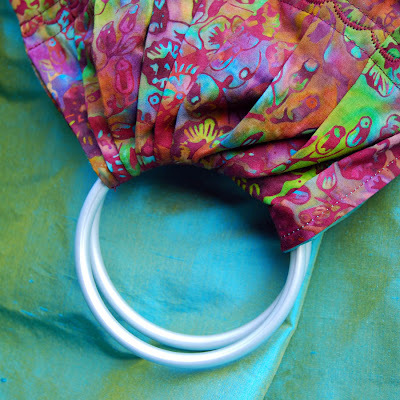 Create a custom silk/silk or silk/batik reversible sling for $70. Or, if you're a DIYer like me and know your way around a sewing machine, make your own. Directions are for a single layer of fabric. To make a reversible sling, stitch the two layers together with the rights sides facing each other, leaving one short end open. Press & turn, then topstitch 1/4" from the edge. Then proceed with the tutorial. Beautiful! It makes me want to learn to sew. Oh that is beautiful! I love it! This is so beautiful! 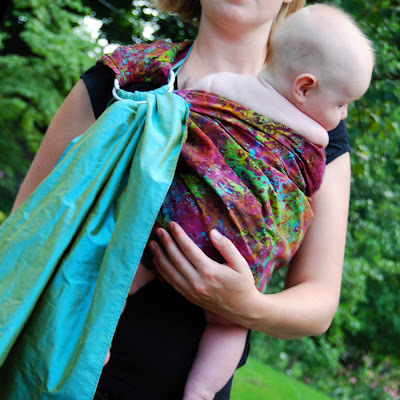 I'm not usually a ring-sling type of mama preferring the Ergo and Hotsling, but this could win me over. GORGEOUS!!! That is one of the prettiest slings I have ever seen!!!! I think I may have to make one similar to that! *sigh* I dream about this sling, it is so gorgeous! Another Dr. Wonderful needs your help!